Sampdoria go into this weekend’s round of matches level inn points with Fiorentina, but three points tonight would see Sampdoria leapfrog their rivals. 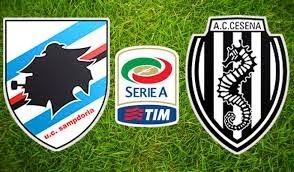 Sampdoria’s overall home record stands at a robust 7-7-0 20/10 with only Serie A leaders Juventus also remaining unbeaten at home to date. They’ve kept six clean sheets so far as well. On the other hand, Cesena remained in the bottom three following last weekend’s 1-0 defeat at home to Chievo Verona, and they’re now seven points adrift of Atalanta who are on 29 points. They are without an away win from their last four with defeats at Empoli and AC Milan while they’ve managed to hold Inter Milan and Hellas Verona to stalemates on their last two trips.